Mount Kilimanjaro at 19,341 feet – Rising high above the Africa plain with its snow-capped summit is truly an awe-inspiring adventure. Celebrated as the “The roof of Africa“ and the least technical climb of the seven summits – makes Kilimanjaro an ideal first expedition for aspiring climbers and outdoor enthusiasts alike. Mountain Gurus, has an approximately 98% success rate. We take great pride in offering a safe and exciting climb of the mountain. The Machame route to Uhuru Peak, also known as Kibo’s summit, is considered by many climbers the most scenic route on the mountain. The route traverses from the Shira Plateau Western Breach and Lava Tower to the Barranco Wall and under the mountains southern glaciers. The Lemosho route offers an exciting alternate approach to Kilmanjaro, the trek allows for an additonal night of acclimatization while crossing the vast Shira Plateau before connecting with the Machame route. We also offer climbs on the less traveled, yet scenic and pristine Rongai route. Our Rongai trek is led by an experienced American mountain guide and offers a quicker ascent of the mountain. The Rongai is considered one of the most direct and least difficult routes on Mount Kilimanjaro. Our guides are trained professionals and our mountain services are simply fantastic. We are also members of Kilimanjaro Porters Assistance Project (KPAP). Which means we believe in paying our porters a fair and ethical wage with proper gear. After the climb we enjoy a magnificent safari in the world renowned Ngorongoro Crater and Tarangire National Park, known for their abundance of wildlife and unforgettable landscape. The Lemosho climb makes for an incredibly beautiful and pristine wilderness journey, plus being significantly less traveled makes it the premium route on the mountain. Our Shira itinerary is one of the most successful treks on Mount Kilimanjaro with 98% of the climbers reaching the summit. One of the best features of the route is the longer, slower ascent which gives the body more time to acclimatize to the altitude gradually thus greatly increasing the success rate. The route also has the added benefit of traveling across the Shira Plateau World Heritage Site. The Machame climb is a more direct and ideal route for aspiring climbers who only have six nights to spend on the mountain. The route has the advantage of an alpine ascent, ascending and descending the same trail on summit day. This eliminates the need to sleep in the summit crater, lessening the total number of nights needed for acclimatization. The Machame route passes through five environmental zones and is among the most scenic areas found on the mountain, traversing under the huge hanging glaciers of Kili’s steep southern flank. The Rongai Route is considered as one of the easiest routes with a high success rate. The route starts on the north side of Mt. Kilimanjaro just south of the Kenyan border, and is one of the least traveled routes. The route is a very scenic and pristine and can also be climbed in 7 days using an alternate route variation for greater acclimatization. The descent is down the Marangu Route on the south side of the mountain, giving the climbers an opportunity to see the mountain from many vantage points. Why trek Kilimanjaro with Mountain Gurus? We are proud partner company of the Kilimanjaro Porters Assistance Project. By climbing with us you can be assured that your porters are well taken care of. We voluntarily participate with KPAP’s monitoring activities and allow KPAP to evaluate the treatment of our porters. Mountain Gurus believes in socially responsible guiding. Unlike most outfitters who employ local African staff with limited climbing and medical skills at low wages, Mountain Gurus provides training and a livable wage to all our Tanzanian staff. Mountain Gurus has been leading trips to East Africa’s Tanzania since 2001. We know Kilimanjaro and we know what makes a safe, successful and enjoyable trek. We offer one of the best values on the mountain. Our local Tanzania guides are friendly, knowledgeable and have vast experience leading first rate trips using the finest camps, healthy food preparation and top-notch porter staff. Our climb provides ample time for acclimatization and yields a very high success rate on the mountain. The food, attention to hygiene, water purification and our customer safety is simply excellent. Unlike other companies, we only use high quality Mountain Hardwear 4-season mountaineering tents and dome style dining tents. We provide full back dining chairs and a private toilet tent for your comfort. Our guide staff is trained in altitude illness awareness and basic first aid. We carry emergency oxygen and O2 sat meter on every climb. The trek is also “fully supported” which means you only carry a small trekking backpack with your essential day gear while our friendly porter staff carries all your overnight gear. Our Mountain Gurus experienced trek planners will make sure you have the right gear, best training and your prepared for every aspect of the journey. Experience the Mountain Gurus difference. Among the best services on the mountain. Whether you are a novice or a seasoned trekker, a journey to Mount Kilimanjaro is an awe-inspiring adventure. Trekking in Africa is different from any other Seven Summits experience because of the diversity of geography you will experience and the wild animals you will encounter as you climb to the roof of Africa. Mountain Gurus is ready to make your travel adventure the experience of a lifetime. Deciding that you want to trek Kilimanjaro is just step one – choosing your companions or deciding to go it alone is step two – and then figuring out who you can trust to get you there and back safely the critical next step. Mountain Gurus takes care of all the arrangements from hotels to equipment, meals on the trek, and professional guides. This leaves you the freedom to enjoy the experience while we take care of the details. What inspires you to climb mountains? Is it to commune with nature, to conquer fear, to challenge yourself or simply because it is there and you can? Are you on your way to conquering all the world’s Seven Summits or is this a bucket list adventure for you? No matter why you trek, Kilimanjaro is worth the trip. Africa’s tallest mountain kisses the sky at 19,340 feet. The monolith is a conglomerate of three dormant stratovolcanoes – Mawenzi, Shira, and Kibo. The latter is the tallest of the three and the summit of Kilimanjaro. Mount Kilimanjaro is the world’s tallest freestanding mountain – other peaks in the Seven Summits are part of mountain ranges, but this beauty rises out of the desert like a lone siren. Kilimanjaro is also unique among the Seven Summits because of the diverse geography that surrounds it. What can I expect on my Kilimanjaro adventure? Your adventure will take you from bushlands to rainforest and then into the heath and heather moors. Once past the lush heat of the lower regions, you will experience the chill of the alpine desert as you stand 16,000 feet above the plains of Africa. We then climb to the glacial summit. You will see more geographic, flora, and animal diversity on this trek than any other summit adventure. It is a rich and diverse experience unlike any other. Wildlife flourishes in the bushlands and rainforest from monkeys to birds and even the notorious honey badger. The creatures will give you a wide berth, but keen eyes and binoculars will let you enjoy the wildlife from a safe distance. How challenging of a climb is Mount Kilimanjaro? The first known summit to the roof of Africa was made in 1889. Since then, untold thousands have attempted it. Another aspect of Kilimanjaro that make it unique among the Seven Summits is that it is a non-technical climb. So, while it is a formidable trek, it is one of the most accessible of the world’s great peaks. It is an adventure that takes you from walking, hiking, and rugged climbing. The climb requires physical stamina and endurance but is attainable by anyone in good physical condition. This makes Kilimanjaro the perfect first expedition for aspiring climbers and an awe-inspiring adventure for even the most seasoned trekker. Even though a non-technical climb, between one-third and one-half of all trekkers that attempt Kilimanjaro will fail to summit. This is where your choice of guide services can make all the difference in the world. You do not want to travel half a world away only to fail to summit. This can make or break your trip and leave you with great memories – or great regrets. One of the key factors in achieving your goal of standing atop this breathtaking peak will be the experience and expertise of your guide and the trekking company you choose. What does my Mount Kilimanjaro adventure include? 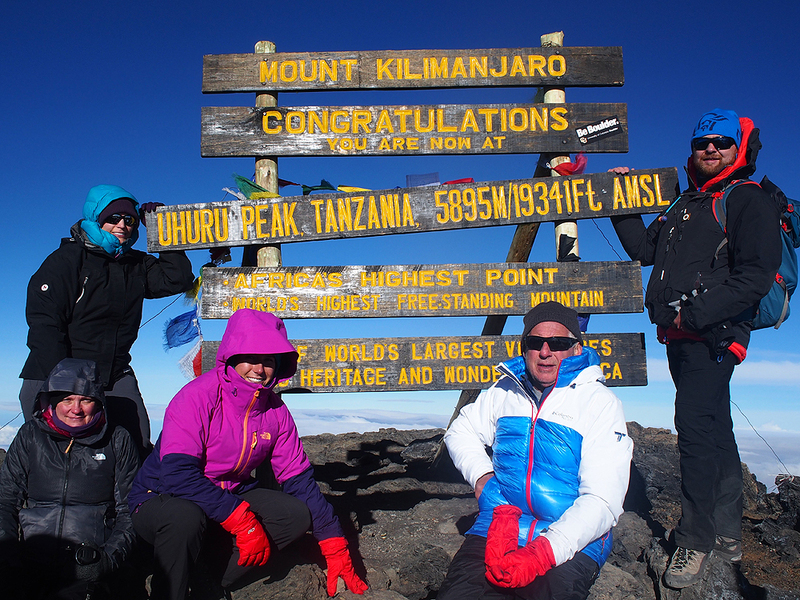 Mountain Gurus treks to Mount Kilimanjaro throughout the year. You can choose to spend five or six nights on the mountain based on your preference of the slower or more accelerated climb. You can also opt for two additional nights on nearby Mount Meru in advance pre-acclimatize. After descending most climbers opt to take a safari. Choose the Ngorongoro Safari or the awe-inspiring Serengeti Safari on the plains on the Great Rift Valley. Once down the mountain, you will enjoy luxury hotel accommodations and a wildlife experience that is like no other. Mountain Gurus always plans our expeditions with our climbers in mind, but we also respect local customs and traditions of our host country. We minimize our environmental impact so you can take away many memories, but leave only footprints. Arrive late evening at Kilimanjaro International Airport, Tanzania (JRO). Mountain Gurus representatives will transfer you to the hotel. Enjoy the day relaxing. There will be an afternoon briefing at the lodge with the trip guide and equipment discussion. After breakfast at the hotel in Arusha, we drive approximately two hours through the rural countryside to the Londrossi Gate. From there we walk about three hours through the undisturbed forest to our camp for the night. With luck you will be able to see Colobus monkeys and signs of elephant and other forest wildlife on your walk to camp. A hike of about six hours will take us up to 14,000 feet just below Lava Tower and then back down to our camp in the Great Barranco Valley. The views of the Great Breach Wall are better from this camp than anywhere on the mountain. Our three hour hike today climbs out of the Barranco Valley and ascends to over 14,000 feet. We then traverse under the glaciers of the southern slopes of Kilimanjaro before we descend into Karanga Valley for the night. As we continue our traverse from Karanga Valley we will have close-up views of the mountain’s Southern Glaciers. We will traverse for a couple of hours before we begin our 2,000 foot ascent to Kosovo Camp. We will start our ascent to the summit very early in the morning while it is still dark. This will allow us to be near the crater rim as the morning sun is rising. After taking in the view from the summit known as Uhuru Peak we will begin the long descent back to Barafu Hut and on down to Mweka Hut (10,500 ft). A final morning’s descent of 4,500 feet brings us to the road. We will have lunch and transfer to the lodge for showers and re-packing. Transfer to the Kilimanjaro International Airport. Or continue on an unforgettable three-day safari. From the Machame Park Gate we start our hike through the Montane Forest, it will take us about six hours to reach our camp on the upper forest edge. Our hike today will be about five hours. We ascend the Machame route climbing above the old Shira Hut. Camp will be in the upper heath zone. As we continue our traverse from Karanga Valley we will have close-up views of the mountain’s Southern Glaciers. We will traverse for a couple of hours before we begin our 1,600 foot ascent to Barafu Hut. Enjoy the day relaxing. There will be an afternoon briefing at the lodge with the trip guide and an equipment discussion. Following breakfast, we will drive you from our hotel to the wooded village of Nale Muru. The drive past villages and many coffee plantations will take five hours. When we arrive, our guides and porters will prepare our equipment and supplies while we complete registration with the Kilimanjaro Park Office. We will begin our trek through fields of maize and potatoes before entering the pine forest. Our ascent begins in the forest occupied by various wildlife until the forest become sparser as we reach the Simba Camp which is near the First Cave. The camp sits at the edge of the moorland zone with spectacular views of the plains of Kenya. When we arrive, our camp and tent is already set up by the porters who ran ahead. They will bring you boiled drinking water and washing water in preparation for a prepared dinner. After breakfast, we pack up for the day’s trek, which will consist of moorland terrain. The trek to Second Cave is pretty consistent in respect to grade and ascent. Along the way, we will catch some terrific views of Kibo and get our first glimpse of the ice fields on the Eastern crater rim. The small shrubs of the moorland became thinner as we approach the Second Cave and stop for a short rest and have our lunch. At this point, we break off of the beaten path and head east across the moorland on a less-travelled path toward Mawenzi. After trekking 10 km, we will enter a cozy valley filled with the giant Senecios plants and the nearby Kikelewa Cave. It is here at the Kikelewa Camp where we will settle in for the night. After breakfast and packing, we begin our relatively short hiking day ascending up steep, grassy slopes. Atop the slopes, we will be greeted with a beautiful 360 panoramic view. Continuing on, we leave behind all traces of vegetation as we enter into the semi-desert terrain. It doesn’t take long now to reach the Mawenzi Tarn, which sits beneath the soaring peaks of Mawenzi. We will be able to relax and spend the rest of the afternoon exploring this area. After an early breakfast and packing our backpacks, we begin our hike by crossing saddle between Mawenzi and Kibo where the terrain resembles that of a lunar desert. We will most likely begin our hike early in the morning to ensure we reach the next camp in time to rest sufficiently, eat and hydrate before our summit bid. We will be just below the Kibo crater wall where we will camp in the Kibo Huts. At this point, we will join up with the Marangu Route which we use to hike to the summit. It is important that we prepare our clothing, water/nutrients and equipment (replace batteries for headlamp and camera) before we lay down early evening and try to catch a few hours of sleep before our summit push. After eating at midnight and double checking everything for our summit ascent, we depart early morning with the goal of reaching the peak near the same time as sunrise. Our trek will be full of switchbacks, winding us up the steep trail before reaching Gilman’s Point on the rim of the crater (18,640 ft/5,861 m) at sunrise. Here, we will finally see the snow-filled crater and its icecaps. Hiking along the crater rim, we reach Uhuru Peak around mid-morning and officially will be standing on the Roof of Africa. We will have time to take pictures with the world famous Uhuru Peak sign, but it is important to begin our descent soon in order to allow enough time to rest at the Kibo Huts. Upon reaching back to Kibo, have lunch, grab some much needed rest, pack up, and return to the Horombo Huts. Enjoy some dinner and some well deserved sleep. Wake up for breakfast as usual, pack, and descend back through the moorland to the Mandara Huts for lunch. Continue our descent through the rainforest, reaching the park entrance by mid-afternoon. A two hour drive and we will be back to our hotel in Arusha. The Mount Kilimanjaro climb continues with a safari. Drive by safari Land Cruiser from Arusha to Lake Manyara. Watch Maasai herding cattle and goats, passing Tema Hills along the way. We enjoy a wildlife drive at Lake Manyara National Park and lunch at Bandas. After lunch, we continue with a wildlife drive and then on to Ngorongoro Highlands. Overnight at a safari lodge overlooking the crater. From the lodge we begin a 2000 foot descent into Ngorongoro Crater. Once inside the crater we will see a huge variety of wildlife close up. We spend half the day in the crater, eating our picnic lunch at a rest area. With luck, we will see rhinoceros. We then drive to Tarangire National Park known for its baobab trees, we enjoy dinner and overnight in the park. Depart on an early morning game drive for a chance to view predatory wildlife. We return to the lodge for breakfast, and continue our game drive in Tarangire National Park. We return and transfer to Kilimanjaro International Airport. Drive from Arusha direct to Lake Manyara, picnic lunch and game drive in Lake Manyara National Park. Drive to Ngorongoro Highlands. Overnight at a safari lodge overlooking the crater. From the lodge we drive 20 minutes to begin the 2000 foot descent into Ngorongoro Crater. Once inside the crater we will see a huge variety of wildlife close up. After lunch, we leave the crater highlands and drop onto the famous Serengeti plains. Our camp will be situated in an ideal location for maximum game viewing. Overnight at safari lodge or luxury tented camp. A second day will give us plenty of time for further exploration of the vast plains and wildlife of the Serengeti. We enjoy lunch in camp, or travel with a picnic lunch and head out for the entire day. Overnight at safari lodge or luxury tented camp. Morning game drive and picnic lunch. Drive to Tarangire National Park for an evening game drive and overnight at lodge. Option of stopping at Olduvai Gorge and Masai Village, additional entry fees required. Mountain Gurus recommends flying one-way to the Serengeti to minimize round-trip driving time. This itinerary may be reversed when flying one-way. Rates are quoted based on double sharing bed & breakfast basis at the Mount Meru Hotel while in Arusha and double sharing tent accommodations on the mountain. Full board double sharing accommodations while at safari lodges and luxury tented camps. Single supplement and additional airport transfers fees apply. A complete clothing and equipment list specific to your trip will be sent to you in the PreClimb information upon reservation. Warm Hat: Wool/ synthetic, one that covers the ears. Sunglasses: Essential eye protection at altitude. Climbing LED Headlamp: Bring one extra set of batteries. Baselayer Tops: Two synthetic shirts are best for trekking. Two cotton shirts for camps. Mid-layer Top: This is a synthetic or fleece top. Softshell Jacket: This breathable but wind-and-weather resistant jacket. Hoods are highly recommended. Hardshell Jacket: GORE-TEX© or a fully waterproof shell. Hoods are highly recommended. Insulated Jacket: 700+ fill down. Heavyweight Gloves: Insulated glove or mitten with GORE-TEX© or waterproof outer. Quick Dry Hiking Shorts: One pair. Good for hiking at lower elevations in the mountains. Hardshell Pants: One pair of GORE-TEX© pants full-length side zips are required; you may need to take off your Hardshell pants without removing your boots. Insulated Pants: One pair of synthetic insulated pants with full side zips. Gaiters: Full-sized waterproof gaiters that must fit snugly over your mountaineering boots. Hiking Boots or Trekking Shoes: One pair medium weight hiking boots/shoes large enough to be comfortable with sock. Sport Sandals or Camp Shoes: These are to wear in camps. Sleeping Bag: Bring a warm bag (rated to 20ᵒ fahrenheit). Sleeping Pads: A full-length closed-cell foam pad and inflatable pad. Backpack: One 30L pack with good support, adequate to carry personal. Liner Bags: One large plastic contractor bags. Trekking Poles: Adjustable and collapsible. A passport and visa are required for travel to Tanzania. American citizens should obtain a visa prior to arriving in Tanzania. The fee for a tourist visa is $100 for 12 month multiple-entry. Vaccinations against cholera and malaria are recommended. Itineraries reflect the date and time you will need to arrive in country for a program. Mountain Gurus programs begin and end in the countries destination city. When booking your flight, you will need to account for travel time and crossing the international dateline if needed. It is easiest to give your booking agent the day and time you will need to arrive. All meals are provided as per meal schedule. See itinerary. A complete clothing and equipment list specific to your program will be sent to you in the pre-departure packet upon reservation. For your safety and comfort, it is extremely important that you adhere strictly to the equipment list. The approach trek requires 5-7 hours hiking per day carrying a 20 lbs. pack, utilizing porter support for personal gear. On summit day for Mount Kilimanjaro we will be breathing heavy, moving slowly, and carrying our 20 lbs. summit packs. Being in top physical and mental condition is key to succeeding on this climb. Prior to the expedition we recommend running, hiking local peaks, backpacking and trekking to gain strength and stamina for the climb. Here’s a suggested progression of treks before attempting Mount Kilimanjaro. What are the physical requirements needed for this trek? This trek requires 6-8 hours of hiking per day with a small day pack. Elevation gains of 2000-3000 feet per day. Strong hiking skills and excellent physical conditioning are required. Who will be guiding the trek? Our Machame treks are led by an experienced Tanzanian guide with extensive experience leading our trekking teams. They will be accompanied by assistant Tanzania guides and porters. The guides and staff are native to the surrounding area of Kilimanjaro. What are the Kilimanjaro trekking seasons? The best periods to trek is from December-March and June-October. Tanzania experiences a long rain season from March-May and a short rain season during November. During the trek you will only carry the gear you’ll use for each day. Porters will carry all your extra clothing items and overnight gear. At no point will you carry camping gear or equipment for overnight. Daypacks should not weigh more than 15-20 lbs. for your comfort. What is Mountain Gurus summit success rate? Mountain Gurus, Mount Kilimanjaro climb is highly successful – we usher 98% of our climbers to the summit safely. We customized this trek to take a slightly longer, slower ascent to allow climbers more time to acclimate to altitude which greatly increases your chance of summiting. The Machame route is considered as one of the most scenic routes on the mountain with a high success rate. The route starts on the south side of Mount Kilimanjaro slightly northwest of Moshi town and is one of the most traveled routes. The Rongai route is considered as one of the easiest routes with a high success rate. The route starts on the north side of Mt. Kilimanjaro just south of the Kenyan border and is one of the least traveled routes. Although the trek itself is less steep than others of the Seven Summits, there are still rigors of the climb that guides must be alert for – key among them being altitude issues. Mild concerns from headaches to more serious complications like acute mountain sickness and edemas must be observed for and treated promptly. Our guide staff pride ourselves for recognizing and treating these symptoms before they become more complex. Mountain Gurus local trek leader has summited the great peak more than 100 times. Our guides and support staff can show you the best of Tanzanian wildlife and culture as you enjoy your adventure. All our guides speak English fluently and are trained in Wilderness First Aid. Consider carefully when choosing among Mount Kilimanjaro trekking outfitters – Mountain Gurus will see you safely to the summit and ensure your adventure is enjoyable, memorable and safe! Do you have shorter safari options available? Spend a day on safari. Mountain Gurus offers a one day safari in Arusha National Park. The park offers a rich variety of wildlife including giraffe, buffalo, zebra, warthog and monkey’s along with spectacular landscapes and stunning views of Mount Meru. Do you offer custom or private safari options?